Italy. 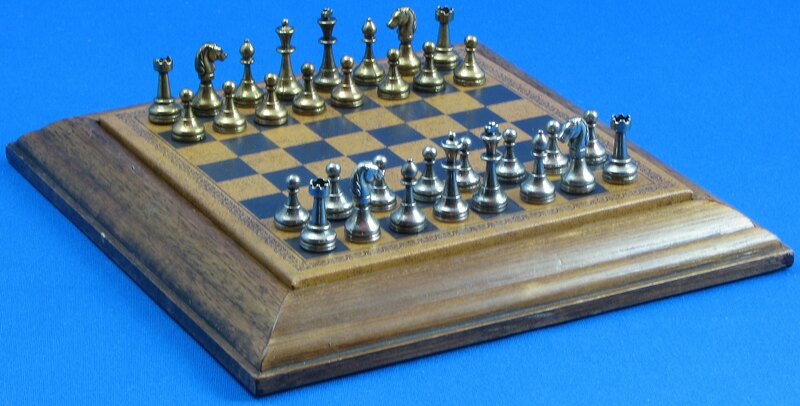 Antique Italian chess sets are extremely hard to find outside Italy. The sets have very characteristic knights. Nevertheless, it is not always recognized as antique Italian by collectors. The ivory Italian set was taken over from another collector. One could call it is a "Mazzini" set, because he owned a similar, but wooden, set. It has some issues like missing finial of King and replaced pawns and discolouration, but I like the set very much. Maybe the issues can be solved by a good restorer. Italy. I was lucky to find the wooden set at Ebay. It has similarities with the more common so called Piedmontese sets. Although Rooks are not all equal, one Bishop's base shortened/replaced and one pawn's finial repaired, it is in very good condition. That can't be said of the box, but that's not a chess box anyway. Rooks could have been mixed with other sets, because these sets were in use at clubs. The base replacement of the bishop could have been done at manufacturer time. Italy. This abstract travertin set could have been made elsewhere, I'm not sure about the origin. I bought the set in 1997 in a second hand shop in the Netherlands, so it is probably a bit older. It was one of the first sets I bought for my collection. Italy. Next 4 sets, all of metal, are made by Italfama, Florence, Italy. Although I could not find the 1st, somewhat smaller, set exactly so in the catalogue, I'm pretty sure it is of Italfama and it is a so called "Mignon" set. 2nd and 3rd set are in the catalogue, but the 4th isn't. I'm pretty sure it is of Italfama and probably it is what they call a "Staunton" set like their similar bigger sets. Italy, probably by Italfama, "Mignon set"? Italy, by Italfama, "art. 94B"
Italy, probably by Italfama, "Staunton"